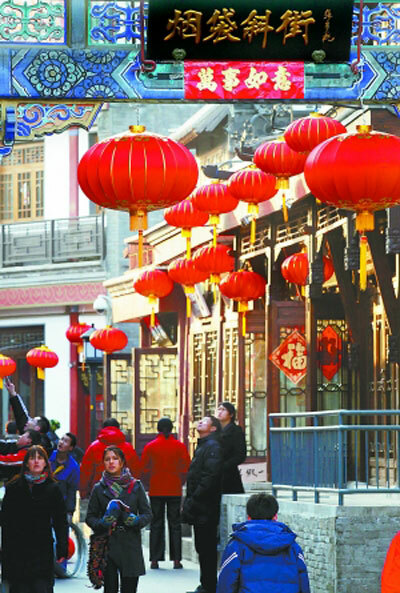 Yandaixiejie is one of the most age-old streets in Beijing. Located near by the Houhai, the street is endowed with a flavor of modernization with some bars and restaurants. 300 meters around though the street is, the history could be dated back to Ming dynasty which is named as Dayuting East street at that time. It changed to be Yandaixiejie later. The story is people who are living in the north of the city have the hobby of tobacco and water pipe. Some people in the street are very smart in doing business so they open the shop of China tobacco pipe (Yandai). Gradually the street changed the name as Yandaixiejie. In addition to the story, the street itself looks like a Yandai. Very interesting coincidence. Nowadays, it has developed into a business street for antiques, artware and so on. The architecture is austerity and elegant full of Beijing features.